This handsome, space-conserving grand piano is suited for the average-sized or smaller living room. It won’t have the power and projection larger instruments do. It won’t fill a spacious concert-hall. But it has a pretty and lyrical tone-quality with a surprisingly nice sustain, given its size. The timbre is definitely a traditional American one, being not too dark and mellow or too bright and harmonic-rich. Though this Weber petite grand piano was built in 1963, the action is tight and doesn’t feel worn. We regulated it nicely too. It was played sparingly so it has decades of musical expression left in it. The condition is excellent; both structurally and aesthetically. It has lived the majority of its life here in Albuquerque and it is happily acclimated to our unique climate. The fine furniture cabinet veneers are American walnut and the finish is traditional satin lacquer. It has a warmth that newer “poly” finishes can only aspire to. It brightened its formal living room, surrounded by artwork and sculptor and did so for decades. This accounts for the wonderful condition. There are six historical decals on the soundboard. They represent By Appointment, the Vatican plus seals of the Heads of State of five countries that have officially procured Weber & Co. pianos. This dignified Weber petite grand piano is an interesting piece of history. 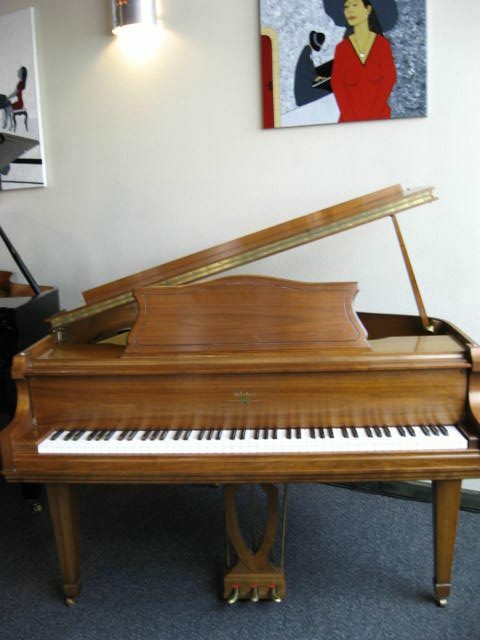 88 Keys Piano Warehouse & Showroom price – $3650. Hallowed, staid and revered. This is one of the most well-respected American piano makers. Albert Weber was born in the aesthetic and cultural Kingdom of Bavaria, Germany in 1828. He left for New York in 1844 as a sixteen-year old. The Weber & Co. piano was then established in 1852 on White Street, New York when Albert was only twenty-four years of age. He had earlier apprenticed and then built his first piano that year with the help of two assistants. The following year, five pianos were built. The first wareroom (retail showroom) was opened in 1869. Eventually another was established in London, England too. Albert lived a relatively short life of fifty years so Albert Jr. carried on after his fathers’ death in 1879. He ran the prosperous company until 1903 when it became part of the start-up Aeolian Piano Co. Aeolian merged later with the American Piano Co. to become Aeolian-American. Some of the most prestigious brands like Mason & Hamlin, Chickering, Hallet-Davis, George Steck and obviously the Weber, were built throughout the 20th century in their factories. Historical Weber Petite Grand Piano in walnut satin lacquer.